There’s been a war raging on for many years regarding the nature of black holes. It began in 1975, when Stephen Hawking and Jacob Bekenstein introduced the idea that black holes should radiate particles and cause the black hole to slowly shrink in mass, a process known as Hawking Radiation. Further investigation of the topic led Hawking to believe that “information” that entered the black hole was destroyed and lost forever. This notion violates several well established principles in physics (unitarity, energy conservation), and as a result upset many theoretical physicists. This conundrum has become known as the Information Paradox. Black holes are compact objects that arise mathematically out of Einstein’s Theory of Relativity. With his theory, Einstein painted a picture of a universe that has four dimensions that make up space-time. 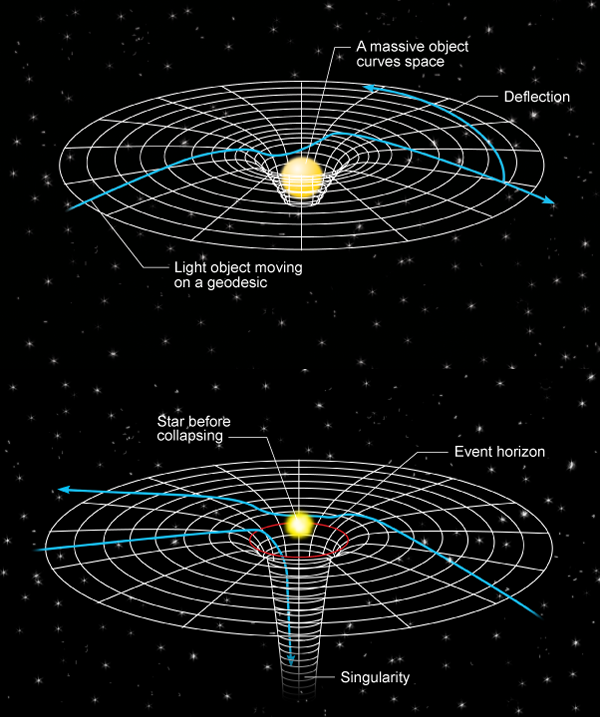 In this picture the force of gravity is represented by a curving of space-time. The more massive an object is, the more severely it curves the space-time around it. What’s interesting about this curvature is that, like mass, light bends around this curvature; it is affected by gravity even though it is massless! It is easy to then imagine an object so massive that it warps space-time enough to prevent light from escaping the region: the black hole. The “point of no return” is called the event horizon. Once beyond this point, the curvature of space-time is too extreme for anything to escape. Hawking radiation arises from quantum mechanical processes that occur very close to the event horizon. Randomly, a particle and its anti-particle pair will be created spontaneously. Under normal conditions, they immediately annihilate each other and are destroyed just as quickly as they were created. But, if this process happens at the event horizon of a black hole, one of the particles might get pulled into the black hole, while the other escapes. The process reduces the mass of the black hole due to energy conservation, and over time will eventually led to the black hole “evaporating” away completely. This is the basis for the information paradox. Recently, some have proposed a solution to the information paradox in the form of a firewall: A region of intense radiation just outside of the black hole that would incinerate any in falling matter. This hypothesis, though widely discussed, has not yet been generally accepted and runs contrary to what is predicted by General Relativity. In this paper, Stephen Hawking is offering a new perspective on black holes that hopes to do away with these paradoxes. His claim is that event horizons do not really exist at all. Instead, there are “apparent horizons”, which behave like event horizons for a short time. The idea here is that the space-time geometry around the black hole changes chaotically in time, making it possible for matter that has entered the black hole to have a chance of escaping at some point. In this way, they wouldn’t be black holes so much as “gray” holes. Professor Hawking explains that in this case, information won’t strictly be lost, instead it will just be vigorously jumbled up inside the maelstrom that is the black hole. He compares it to a more familiar chaotic system, weather, noting that while it is deterministic, one cannot predict the weather more than a few days in advance.